Yossi Benayoun may make a surprise return to Liverpool with Chelsea set to sell him to his former club, or Arsenal. Benayoun is expected to leave Chelsea before the close of the transfer window after falling down the pecking order at Stamford Bridge. If Benayoun returns to Anfield then it might pave the way for Raul Meireles to leave. It’s understood the Portuguese international, currently out injured, wants to quit Merseyside because he believes his first-team opportunities will be limited by Kenny Dalglish’s summer signings. Chelsea have expressed an interest in acquiring Meireles and it’s understood the two clubs are discussing the possibility of Benayoun being included in a player-plus-cash exchange. 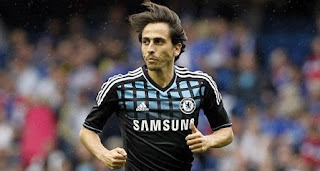 Arsenal could also be one of the clubs interested in Benayoun with Arsene Wenger desperate to bolster his squad before the close of the transfer window. Wenger is in the need of midfield reinforcements after losing Cesc Fabregas and Samir Nasri and Benayoun could help bring some guile to Arsenal's midfield if he steps up his interest in the former West Ham and Liverpool man. The Israel international fuelled talk of a move away from Chelsea after handing over his No.10 shirt to new signing Juan Mata. Benayoun has failed to establish himself at Chelsea since arriving from Liverpool last summer, making only ten appearances following a serious Achilles injury. Benayoun has indicated on his Twitter site for the past couple of weeks that he is likely to leave Chelsea.